Omens and I had a bad start: I was rolling my eyes right from the second chapter when we meet Olivia, her wealthy family, her imminent wedding with an handsome gentleman, and her being bored at doing charity work instead of pursuing a career. However, she soon tumbles down the social ladder after discovering that she was adopted and that her biological parents are horrendous serial killers. Her (foster) mother flees to Europe after throwing some cash at her face and her fiancé “postpones” their wedding. She loses everything, runs away from an army of journalists and finally rents a dirty apartment in a remote cloistered village full of gargoyles called Cainville, working as a waitress to make both ends meet. Much, much better. Omens seems to be about Olivia trying to discover who everybody is for real. Herself, for a start? How much did she get from her biological parents? Are her genes the reason why she didn’t quite fit in her previous life? Whose daughter is she? Could she be a psychopath herself? What about her parents, the Larsens, who were convicted for eight ritual murders although they have always claimed to be innocent. Could they be? And Gabriel, Mrs Larsen’s last lawyer: at first sight, he’s just a brute sniffing money. Working with him, Olivia suspects he is hiding something. And finally, what’s up with Cainsville inhabitants? These old people look a tad over-superstitious really! I really love Omens for showing repeatedly that there’s always more than meets the eye. There is also a nice theme about who controls your life. Olivia is trying hard to become herself, whoever that is, but it feels like multiple forces are trying to control her: her genes, her long forgotten education with her biological parents, then with her foster parents, social and media pressure. She doesn’t know what genuinely defines her, what made her who she is, and how much other people shaped her. In the end, Omens turns out to be mostly a crime-story with Olivia investigating the last couple of murders attributed to the Larsens. That’s where Omens disappointed me a bit. Random House puts it into the Fantasy genre, as well as GoodReads, but I found the fantasy elements very weak, if not completely anecdotal. There is definitely something spooky about Cainsville and the book does talk about neo-paganism, neo-druidry and witchcraft. Olivia might have some supernatural skill too, it’s not too clear (she might also be a nutcase). However, I wouldn’t be surprised if the next book in the Cainsville series is much more into the fantastic because Omens really paved the road to a full-blown fantasy sequel. 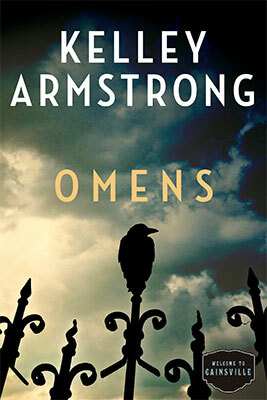 Overall, I loved Omens. It’s a fast-paced thriller with really likeable characters and a catching plot. It’s a bit weak on the fantasy side but the crime story and Cainsville’s universe are really worth it. It’s a perfect read to relax during the summer!